Do you use the iodized salt? 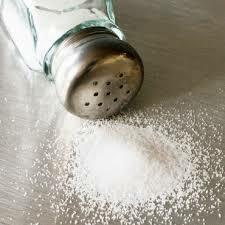 Here the law requires that all the salt must be iodized. It is difficult to buy the normal salt. Actually I don't think it is very necessary. Since in my city we often have seafood and we are not lack of the iodine. Perhaps in some other places in my city the people need this element. But not all the people need it. As too many iodine will be not good for the health. How about you? I have the choice but I have always bought iodized salt. At least you have choices. In the world only the 40% of the population is at risk of iodine deficiency. Not enough iodine is a risk and too much iodine is also a risk. I know that I eat many food containing iodine, so I prefer to use natural sea salt instead than iodized salt. I feel the same. This is why I went to Hong Kong to buy the normal salt without iodine. @youless It's crazy how governments take a decision without considering that not everyone needs iodine. When I lived near the Mediterranean sea we were able to buy salt without iodine everywhere. Here in Switzerland there is no sea and all the salt contains iodine. @LadyDuck You are right. I still prefer to have a choice. It is just like the coffee can be healthy, and also can be unhealthy if you drink it a lot. It is almost a law here for us to use iodised salt. It is exactly the law here to use the iodized salt. But I don't think it is necessary because as a city like mine, we often eat seafood. I limit my salt intake, but know that my iodine levels are fine; and I do not purchase iodized salt, but use sea salt. I think limit the salt intake is a good choice. As I heard that it will lead to many healthy problem if you have a lot of salty food. @youless It certainly can. I'm not sure if that is the same for all peoples, but it is here. No! I don't like salt. I use pepper, garlic and herbs. But salt is still necessary to cook. @youless ...No. Most things already have some. I never add any. A balanced diet you think would not need an iodine additive. Some people lack it while others get too much. @youless I'm happy that you agree with me. I just don't know where I fit on the scale though I don't think I'm extreme one way or another. Do you come from India? As I can't see where you come from besides your name here. @youless I am from Nepal. In india too it's compulsory to sell iodized salt. Having choices is always good. I am a salt junkie, lol I know it's so bad for me but I can't help it. I am a healthy eater most of the time and I am also pretty active. Salt is my "treat" for most days. I have cut down on a great amount of salt in my diet though, by using fresh garlic, onions and other fresh spices to flavor my food instead of reaching for the salt shaker! We shall not take a lot of salt since I heard that salty food will lead to high blood pressure. Yes, I think that is an overkill too. There are many food with iodine in it, and we can easily get from our diet. Many of us take in multi-vitamin pills too, and these will give us enough trace minerals, including iodine. I haven't noticed this feature about salt until reading your post. My salt isn't iodized. My brother has hyperthyroidism and avoids taking iodine rich foods. Perhaps your brother has to avoid the seaweeds, too. We use both, iodized if we want fine salt and rock salt for like salting fish or meat. We have plenty of salt, our city use to be salt manufacturing during the 60's before the lands were converted to many private subdivisions. Here the salt is produced by the state companies, I think. I use iodized salt but it is sea salt youless. I do not get enough of seafood here. Good you do. Here it is so often for us to have seafood. So I don't think the iodized salt is necessary for us here. Yes we do use iodized salt here.